It’s one thing to capture attention when you’re a newcomer. But how do you continue to stay relevant to your original base of customers while innovating and appealing to a new generation? Over the past several years, Marvel Comics -- a brand with a long, storied history -- has exhibited a pop cultural dominance that has been nothing short of superheroic, thanks in part to the work of Sana Amanat. Amanat is the director of content and character development at Marvel, and her job description is as wide-ranging as the title suggests. It entails seeing the ways in which the company’s more than 8,000 characters can evolve across television, film, games, consumer products and more. “It's about figuring out all the different touch points that exist within the Marvel ecosystem, [and] how to access different kinds of fans that are out there,” Amanat tells Entrepreneur. She characterizes what’s happened at Marvel over the past 10 years as a “content explosion,” and she’s not exaggerating. The company is 78 years old with no signs of slowing down. Marvel Entertainment currently has seven television series on air with four more in production by end of 2018. And since 2008, Marvel Studios has released 16 films that have a combined worldwide box office gross of more than $12 billion. The questions she says she always asks herself are “where have we been, where are we now, [and] where can we go next?” But Amanat notes that she always grounds herself where the company got its start: its characters, including one she created. 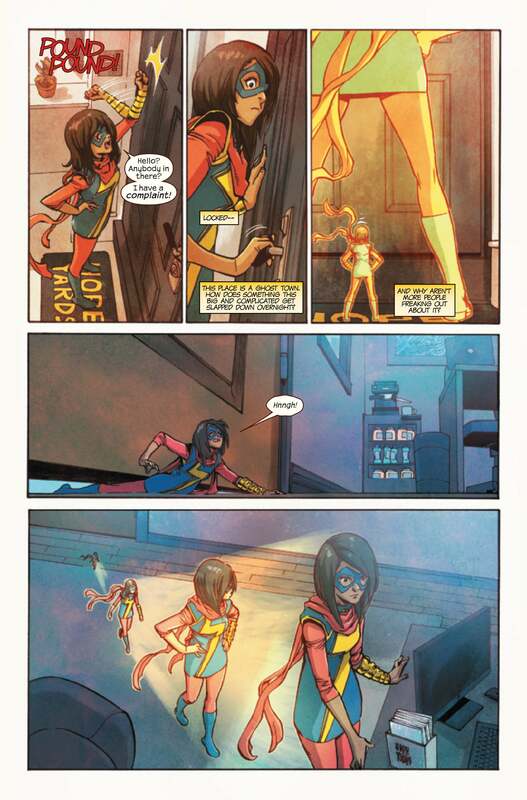 In 2013, with writer G. Willow Wilson, Amanat co-created Kamala Khan, the new Ms. Marvel. The loyal, geeky and exuberant Pakistani-American Muslim teen from Jersey City has made history as the first Muslim-American superhero to get a solo comic book series -- one that has sold more than 1 million copies to date. The following year, Amanat helped launch the Women of Marvel podcast to give fans old and new a glimpse into the inner workings of the company. Amanat, who started as an editor in 2009 and was made director of content and character development in 2015, says that the past few years of her career have been both challenging and thrilling. Read on for more insights from Amanat about the keys to successful collaborations, the mindset you need to have at the negotiating table and how to tell stories that truly connect with people. Why is your work at Marvel meaningful to you? I grew up just as a lover of stories from a very young age. I have three older brothers who lived in their own universe. I wanted to be just like them. I couldn't be -- I was a bit of a tomboy, and then I was a bit of a loner. I think stories took me to a place that allowed me to be independent and allowed me to really delve into my imagination. They really made me feel less lonely. And I think a lot of people can say that. Comics in particular -- and the stories that comics represent -- took me to even more wondrous places. I loved sci-fi growing up. I actually got into comics through Archie and Calvin and Hobbes. I got to the superhero part of it a bit later. For me, it is incredible to be able to have an impact on characters that are so integral to American pop culture. These are icons -- the company is an icon and of each of these characters are icons. 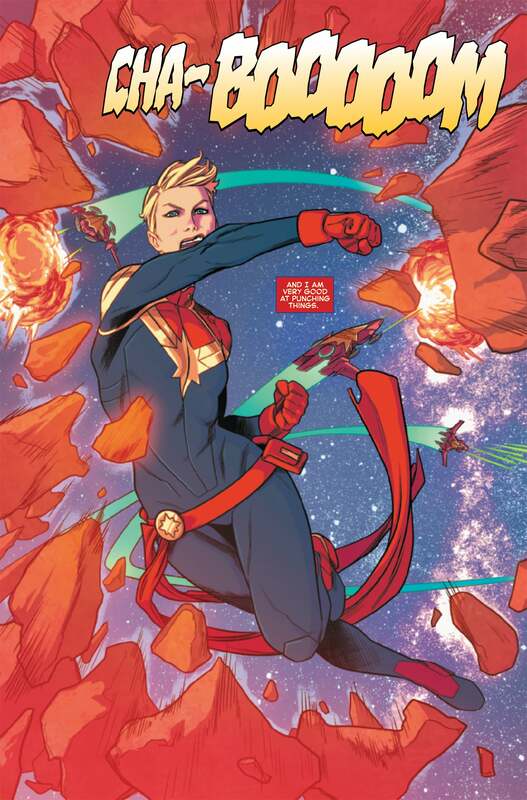 And to be part of the process of not only impacting their growth and their exposure, but finding a way to bring in more people into the Marvel playground is pretty meaningful because I think so many more people can be excited about our content and what it represents and what it can do for them. In your experience, what are the elements of a successful creative collaboration? I think it's important that people are working toward the same vision, the same sort of creative intention. But at the same time, allow and challenge one another to look at things from a different point of view. Because if you're rigid in your point of view, then you're not really going to be able to create something new and fresh. The great thing about collaboration is that you're bringing together two different elements, and two different points of view. Usually in comics it's at least three to four people. You're bringing in all these different points of view that also come with different experiences and contexts, and injecting that into a story or an idea -- and I think that's what really gives it a unique sensibility. Putting together two different, almost contradictory ideas and making something original out of that. That's really what storytelling is about. I love working with different creators and writers, and seeing what they're going to offer and what I can offer. And us constantly challenging each other and pushing each other to do the best work that we can possibly put together. What is your best advice for creating content that truly resonates with people? When you want to make content that is meaningful, I think you have to try to not look at the big statement, but try to go as small as possible. Try to go down to the nitty gritty of who that singular character is -- what they want, what they're afraid of and what their challenges are. What are the elements that really make them a human being? What are the elements that make them relatable? Or even, what are those elements that make the audience angry with them? You really need to make the audience connect with that character. I think if you can start with a really interesting character, that's going to be the hook that's going to take you through all the different plot devices and the set pieces, and all the various obstacles that a character is going to go through. Fundamentally, it just comes down to us being like "Oh, I like that person" or "That person pisses me off." But I'm still championing [them]. I'm still on their side. I still want to see what happens with that person. You need some sort of emotional electricity when you're trying to connect with audiences. I always try to start small. Then you start figuring out, what is your intention? What are you trying to relay to the reader? And it's not really about the "theme.” I think that's an aspect of it, of course. But it's really making sure that you have a mission statement for what that character or group of characters represent, and making sure that that is constantly interwoven throughout the story, whether you're on issue one or on issue 51. How can you make sure that theme consistently comes back? Because then you have a real anchor for what this story is about. And that also offers you more storytelling opportunities as well. What have you learned about what’s required to innovate in a company with a long history? I've learned a lot and I'm still learning quite a bit. It's very strange to go from the creative side of things [as an editor] and then to move into the corporate side of things, because I think I have a grounded perspective of the company -- really where the company began, which is in comics. The heart and the soul of the company I think is within the publishing space. That's really where all the ideas will extend from. Moving from that side to the corporate side has been fascinating because then I can look from a very macro perspective as to how all the elements work together, where elements need to be moving. What's working, what's not really working. So I have to be very flexible. You do have to figure out how to respond to crises very effectively. How to be patient, particularly at the executive level, and know how to interact with different kinds of personalities. And also just know how to be a human being. I think people get so caught up with needing to be a particular way, needing to be a particular kind of professional, saying all the sentences in the right way. And they don't know how to just talk to an executive and say look, this is the problem that I'm having, ask questions and understand that as much as you are making an impact and doing your job, at the same time everything is a learning opportunity. How have you grown and changed as a leader? I think because there was such a massive learning curve in the beginning, it was me just trying to figure out how the different aspects of the company were working together. I think from there I was just taking in a lot of information, and I was learning a lot from my superiors. There has been a great amount of learning that I have taken in and there's still some more learning to do. As a leader, I think it's been really interesting to understand how to try to cultivate the next generation of staff. And figure out ways in which we can [not only] find their strengths, but try to find a way around their weaknesses and talk them through it and figure out ways in which we can troubleshoot any types of issues together. I've had some really great superiors over the past few years. I've had great mentors and people who really taught me a lot. And I've taken lessons from them, because they have treated me like an equal. They've been like, "OK, I think that you have something interesting to offer," and they would ask me questions. And if I was wrong, they would [have me walk me through] my thought process. They would constantly challenge me, and I think that really helped me because anytime that anyone is reporting to me now, I try to make sure that they are a partner in the decisions that I make. I let them know I rely on them as much as they rely on me. When I ask them to do something, I'm not going to micromanage them. I'm going to trust that they're going to learn on their own and they're going to try to figure things out and troubleshoot problems on their own. Whatever they need from me, I'm there. But I'm not going to micromanage them because I've hopefully hired people that I think are intelligent enough to handle the tasks that I've given them. And at some point when they get confident enough, I'm hoping that they're going to be able to participate in some of the issues that I have. I love bringing up the next generation of staff. I love seeing how personalities can develop, but also where we can potentially take people across the company. Sometimes people start in one part of the company and end up shifting to another. Looking at people and seeing where they are best suited. I think it is incredibly important. You have to look at your staff and see if they're suited for the role that they currently have. And if they're not, figuring out a way they can go somewhere else. Can you talk about a moment in your career when you had to advocate for yourself? How did you approach it? Every time I've gotten promoted, that has been me advocating for myself. It has been me walking to my boss and saying these are the reasons why I think that I should be promoted -- and you need to explain to me why I shouldn't be. And a lot of the times either it's budget reasons or it's timeline stuff, there's a lot of different reasons. And then I would give them a timeline back. And I would say well that's fine -- this is my timeline, this is what I expect promotion-wise or whatever it might be. But I'd also just try to be firm and not like I'm complaining [or that I think it is something I’m owed]. It's a bit of a tricky balance, but [the core of those conversations are] if you can offer me this, I can offer you this. It's always a negotiation. But it's always very tense. Before I do those things, I tend to write down all of the different aspects of my job and all of the different aspects of what I want, so I'm prepared before I go in and have that conversation. I need to be able to go in and say this is my value, and this is how I can increase it. That's the argument that they're going to need to go to their bosses and say hey, this is the value of offering Sana [this promotion]. When you look at those things from that perspective, then you can have real conversations. What do we miss out on when people don’t see themselves represented in media? I just think we miss out on really pushing the creative limits of storytelling and getting the best stories that we possibly can. Because when you're constantly telling stories from one point of view, they're going to become mundane. And then we're not going to be challenging our readers to be curious about the world. So much of what we learn is, yes, from history books, but also from our story books. And so much of our curiosity and our sense of imagination stems from that. Our desire to travel to other countries and learn other languages. It all stems from a sense of curiosity and wonder of the world. [From when I was very young] I perceived the concept of beauty to be one particular thing. My perception of beauty came from what I was told beauty was. Which is always going to be baseline caucasian, for the most part blond and blue eyes. That's what I was told. Any time I would watch a movie or read a book, those were the images that were presented to me. That's what was offered. And as I started seeing more and more representation, I started looking at the world from different angles and started seeing different kinds of points of view. I started seeing literally different visual representations of the world and you start appreciating beauty in different forms. Diversity in all forms of creativity is extremely important and I'm not just talking about what a person looks like. I'm talking about art forms. When you want to take something in, try to experience it from different kinds of styles, because then you have a much more holistic perception of what that particular art form is. I think that really speaks to the importance of "diversity" in folks' experiences. With someone being brown vs. black vs. white, all of that comes from very different experiences. And the most exciting thing is figuring out what unites us and what differentiates us and that makes the world so much more interesting. It gives it so much more color. What is your best advice for someone who is interested in getting into a creative field? Depending on what the creative field is, I would say work on that craft. Whether you want to be a writer, whether you want to be an artist, get to know that craft as well as you possibly can. Understand why you like it. Understand what your sensibility is. But also be OK with the fact that there are other sensibilities out there and try to get to know them as well, even if it's not yours, even if it's not your cup of tea. I think it's important that you try to diversify your appetite for what kind of craft you enjoy to make and you enjoy and what kind of content you like to consume. Immerse yourself as much as possible and find creative peers. Find creative mentors and understand that sometimes, particularly in the creative field, a lot of your inspiration might just come from really unexpected places. Once that inspiration actually hits, you write it down. Explain to yourself why that inspired you. You can read it later and be like, "Oh, this is terrible." Or you can read it and be like, "Oh, this is where my mind went, and this is why it went there." So just make sure that you're constantly consuming and keeping your eyes open and immersing yourself into the world as much as possible. And find the right partners and allies to help you develop your skills even further and challenge you. The biggest thing I would say is, be OK with criticism. But understanding how to react to criticism and knowing who to trust to offer you criticism is a big thing. Sometimes people can give you criticism and they have no idea what they are talking about. But knowing the people that you feel have something to offer that you respect, I think is an incredibly important. Because if you don't have that criticism, you don't know how to collaborate.